It may have been one of the best technical displays ever seen on these shores, but Alessandro Del Piero’s performance in Saturday night’s blockbuster also showed young footballers across the country the importance of having a winning mentality. And he wasn’t the only A-League star to demonstrate that this week, with Besart Berisha and Jason Culina also showcasing the type of mental strength required to be a gun professional. Del Piero may have ended up on the losing side but, in one of the great nights in Australian football history, he showed off the attributes that have kept him at the top for two decades. Apart from the technical features, which included a superb free kick, sharp turns, a first touch which sets up his second, accurate back-heels, drops of the shoulders to send defenders the wrong way, supreme protection of the ball, use of every part of the foot and both feet, accurate long and short passing and clever movement, he showcased the one trait which tends to sort out the very good from the great. You often hear the word mentality bandied about, but Del Piero exemplified exactly what a winning mentality is, picking up his team, driving them forward, making them believe they could not only compete, but win. 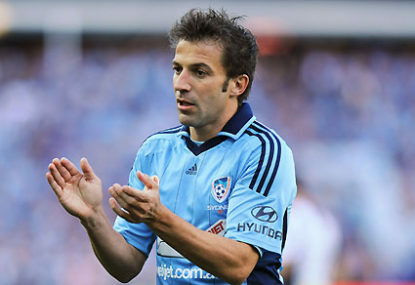 When Sydney FC went behind to a poorly defended set piece early, many heads around Del Piero dropped. 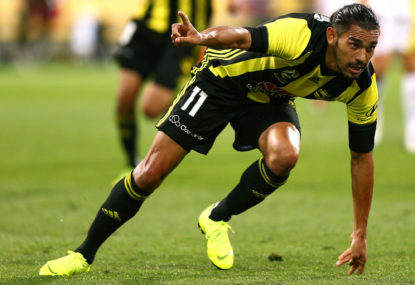 The passing was sloppy, many seemingly frightened by the occasion, particularly after an insipid season opener in Wellington sapped the confidence. Del Piero may have become frustrated, and had a sulk. But he didn’t. Instead he started to drop deep and get on the ball, demanding it, wanting to influence his teammates, the game, and give the huge audience a show. He not only understood his responsibility but accepted it. In one single moment, midway through the first half, he took a ball at feet, turned and drove goalwards, drawing Tiago Calvano into a rash challenge. Managing to pinch a couple of metres, he stood over the ball, measured the wall, waited, picked his spot and executed. Never in doubt. It was utter pandemonium across Allianz Stadium. Del Piero delivered, the fans had their prize, and Sydney’s play improved markedly. Yes, Ian Crook’s men conceded a couple of further soft goals and lost the match, but at least there was a determination to drive forward. Leading the way was Del Piero, always looking to keep the ball and influence, or make a run, turn, strike or feed. He mightn’t quite have the legs these days, but continues to prove, through the soundest technique and determination, the importance of wanting success. 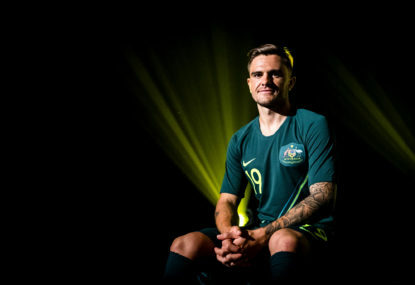 It’s a lesson not only for the likes of Dimitri Petratos, Mitch Mallia, Joel Chianese, Terry Antonis and Hagi Gligor, but young footballers across the league and nation. It’s one thing to have the talent, but the lesson is that only through sheer desire will you achieve the success. One A-League player who needs little motivation is the Brisbane Roar’s highly driven Albania striker Berisha. 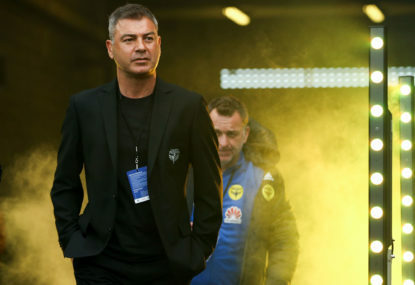 Last week he was subjected to one of those tough weeks for a footballer, where all the attention on him was negative after the grand final penalty moment was used to hype-up the re-match away to a hostile Perth Glory. So tense was the build-up and match that, on a couple of occasions, things almost boiled over. It was a tough day at the office for Berisha. 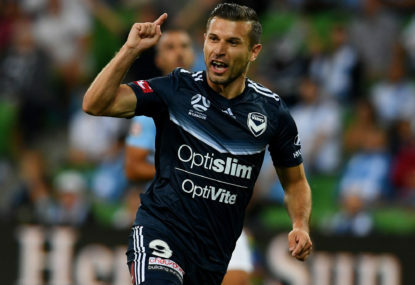 A lesser player might have gone hiding the next week, but Berisha responded with a star display against the Victory on Saturday night, setting the tone early with his high-octane pressing, a constant menace to Ange Postecoglou’s defence. What continues to impress so much about Berisha is that the intensity of his press is as high in the 93rd minute as it is in the first. His reward was not only a brace but a comprehensive 5-0 win. Another player who rebounded this week after enduring a torrid recent run is Culina, who signed a contract with Sydney FC after an almost two year battle with a serious leg injury. Like Del Piero on Saturday, there were many times in the past where Culina single-handedly picked up his Gold Coast United teammates and drove them on. Indeed, often, he was probably guilty of trying too much, covering every part of Skilled Park, probing and prompting. It was this same determination that helped him beat his injury, and the A-League and Sydney will be better for Culina’s return. 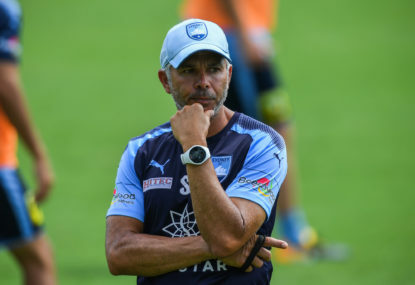 In a week where the domestic competition continued to make significant strides, Del Piero, Berisha and Culina reminded us that behind all the glitz and glamour, it’s the hard work and thirst for success that helps you get to the top and stay there.